The agency was originated in 1972 through the efforts of Evadeen Coleman and numerous other concerned individuals who formed an organization called the “Citizen’s Committee”. The Citizen’s Committee armed only with the knowledge that state monies were available if $1500 dollars could be raised locally to start a sheltered workshop for retarded adults. Mrs. Coleman, leading the citizen’s drive, went to banks and individuals for donations until they had $1500. The Egyptian Public and Mental Health Department in Eldorado Illinois was already operating mental health programs in Gallatin, Saline and White counties and had agreed to sponsor the sheltered workshop in all three counties rather than just Gallatin, but insisted they needed $3,000 of local monies to include Saline and White counties. Mrs. Coleman and the Citizen’s Committee realizing more individuals could be served with the three county operations expanded their membership to concerned citizens in Saline and White counties. With the expansion many local people and organizations became involved. 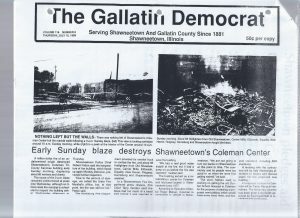 Jim Doyle, editor of the Gallatin Democrat began to cover the stories, which led to first a Gallatin county cause then expanded into a three county cause. 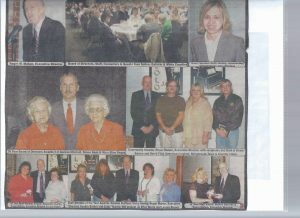 Nearly every paper in the three county areas started to write about the work of the committees. Several of our board members were very instrumental in the early development. Mary Ellen Beggs and Geneva Mitchell of Saline Association for Retarded Citizens, and past member Lucille Newcomb of White County, worked in their respective counties. The process of collecting local monies was again initiated, this time in Saline and White counties. After many days of asking for handouts and donations they had their $3000. Mrs. Coleman took the money to the Board of Directors of the Egyptian Health Department only to be informed that the costs of the program were under estimated and that they would still sponsor the program, but they needed $5000 locally. Still determined, the Citizen’s Committee went back to the communities for more support. Again a lot of work and time went into their cause. They returned to the Egyptian Health Department Board to be informed a third time, more local monies would be required, this time they needed $7000. Where most people would have admitted defeat, the Citizen’s Committee only grew stronger. Through the same tedious methods of collection the committee raised $7400 and returned to the Health Department Board. This time, the Board realizing both the support and determination Mrs. Coleman and the Citizen’s Committee had, agreed to sponsor the program to be named very appropriately Coleman Sheltered Workshop. The first step of the agency could affectionately be called the “Blood”, because the next 5 years of development were the “Sweat and Tears”. With the money collected, the “Sheltered Workshop” now needed a home. The Health Department Board felt that because the concept had originated in Gallatin County, the facility should be located in Gallatin County. The Shawneetown School District agreed to rent the Egyptian Health Department an old abandoned school building in Junction, Illinois at an annual rate of one dollar. With 3 staff members and a secretary, the sheltered workshop opened its doors in 1972. The early operation consisted mostly of crafts from donated equipment and constant repairs on the old building. The building, one of the oldest schools in the county, was designed for 9 months use and did not provide the best working conditions. Sweat would run down your brow in the summer and you could see your breath in the winter, but the operation continued. The 3 staff members (among them Evadeen Coleman the Education Instructor) transported the consumers to work in their cars. The system continued for 2 years. In July 1974, the agency employed its first Director, 4 additional staff members, purchased two 11-passenger vans, and added an additional program, Work Activities. With the additional program in the old building the agency changed its name to Coleman Rehabilitation Center. Still under the administration of Egyptian Health Department, the Director made continued requests for a new facility, stating the agency had a tremendous potential. In 1975, an Advisory Board of concerned citizens was created to aid in the request for new facilities. It was in November of 1975 that the Advisory Board decided to form a separate organization called Coleman Tri-County Services. From the onset of the new corporation was the constant request to the Egyptian Health Department Board for betterment of Coleman Rehabilitation Center. In March of 1976 both the Division of Vocational Rehabilitation and the State Fire Marshall condemned the old building. Coleman Rehabilitation Center was to be closed unless a new facility was obtained. The new Advisory Board of concerned citizens made a final request to the Egyptian Health Board for a new facility. They were met with a motion that they had approximately 3 months to become an independent entity or they as an Advisory Board would be dissolved and the Director of Coleman Rehabilitation Center dismissed. It was during this time of meetings by the Advisory Board trying to establish organizational documents and design a method of creating a separate agency, that Coleman Rehabilitation Center experienced an approximate 40% turnover in staff. Once the Advisory Board felt they were ready to become a separate entity, they were informed by legal consultants it could not be accomplished. With the same desire of Mrs. Coleman and the Citizen’s Committee, they found a way. On January 1, 1977, Coleman Rehabilitation Center again changed its name. 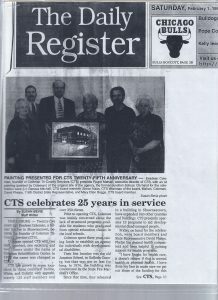 The new name Coleman Tri-County Services Inc. became a separate agency; Coleman Tri-County Services Inc. was on its own. In March of 1977, Coleman Tri-County Services initiated a new program “The Homebound 0-3”. Still in the old schoolhouse, the new corporation met as much as possible with the goal of a new facility. In September 1977, Coleman Tri-County Services moved into their new facility in Shawneetown, Illinois. 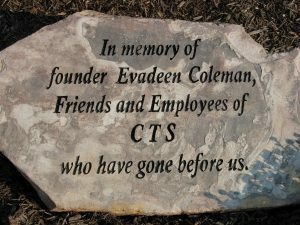 On September 30, 1978, Mrs. Evadeen Coleman retired from Coleman Tri-County Services with a statement to the Board of Directors that she now has complete confidence in the agency’s success. Once we became a separate agency, many hours of hard work by the staff, The Board of Directors, and other involved people began to pay off. As a new staff or board member, you can review our new facilities and expanded services and see why we take pride in our agency. It would be impossible to acknowledge individuals and their contributions that led us through the past. We, instead, ask that you share in our pride and help us create the future.